In these essays, a noted bioethicist takes a thoughtful, wry look at his personal life as a way to touch on larger issues. Appel (Scouting for the Reaper, 2014, etc.) is one of life’s overachievers: a physician, attorney and professional bioethicist, he also writes fiction, essays, opinion pieces and plays; his 2012 novel The Man Who Wouldn’t Stand Up won the Dundee International Book Prize. This strong volume brings together 13 previously published essays, in which Appel delves into his family history, childhood and other personal experiences, generally as jumping-off points for insights related to his medical, legal and ethical concerns. In “Two Cats, Fat and Thin,” for example, Appel spins an anecdote about stolen toys into a consideration of wealth, privilege, loss and changed lives. Should his parents try to get back Appel’s toys, which may have been stolen by a motel maid for her own son? : “Did I really want to yank [them] from his deprived little hands? Yes, I did.” Here, as in other essays, the author is disarmingly willing to consider his own shortcomings and misprisions. Several essays examine the role of history in family culture. His Belgian Jewish grandfather’s experience of anti-Semitism, for example, led him to adopt “Never, ever, stick your neck out” as a motto—which, Appel comments, is “probably good advice when you’re hiding from a mob of middle-class churchgoers lobbing stones, but my grandfather applied it universally.” Among the many thought-provoking pieces is “Opting Out,” which examines decisions around death and dying. Here, too, Appel mixes personal observation, family drama and his work as a physician to tease out difficult issues: “My grandfather had always said, ‘Where there is life, there is hope,’ which may explain—at least, in part—our family’s reluctance to withdraw care. But the unfortunate reality is that, where there is life, there is often false hope too.” Readers may not agree with every conclusion (“No acute sorrow, not even the death of a friend, compares with romantic rejection”), but they will understand how Appel reached them. 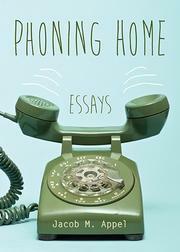 Entertaining, intelligent and compassionate essays that provoke reflection.